McLean's Ben Crockett steals the show, and Milford's Taron Smith puts forth a valiant effort as the Tigers claim their first state title. McLean's Ben Crockett. Photo by Zac Byrd. In the first half of Wednesday afternoon’s Class 1A Division I state championship game, McLean leaned on the big-play ability of Ben Crockett to power the Tigers’ offensive attack against Milford. Crockett, who entered the game with 2,383 rushing yards and 50 touchdowns this season, continued to shoulder the load with the state championship game on the line. He accounted for five touchdowns in the first 20 minutes of play, giving the Tigers an 8-point lead at the break. But Crockett’s most important play came midway through the third quarter. Milford had a chance to come up with a sack on second and long, and even began to drag Crockett down while the ball was still in his possession. 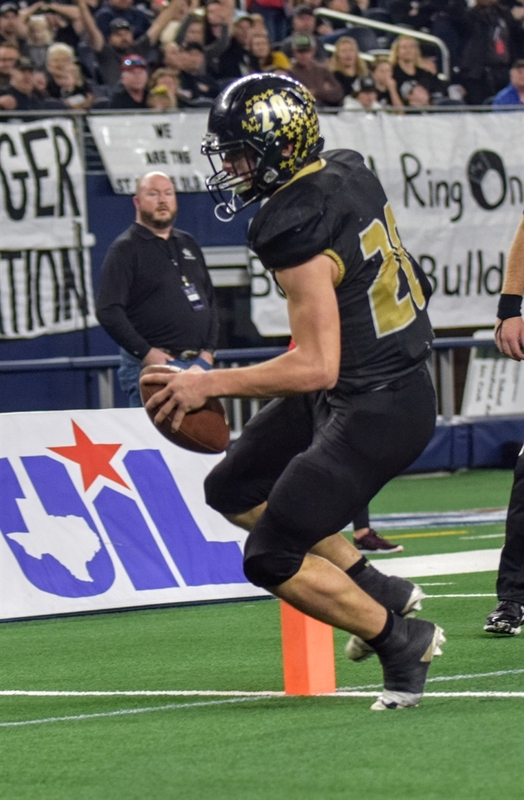 Instead of taking the sack, Crockett somehow managed to toss the ball to a nearby Cayden Mann, who made a couple of defenders miss before breaking away for a 47-yard touchdown. The unlikely score gave the Tigers the second-half cushion they needed as the team began to pull away for an exciting 100-70 win. 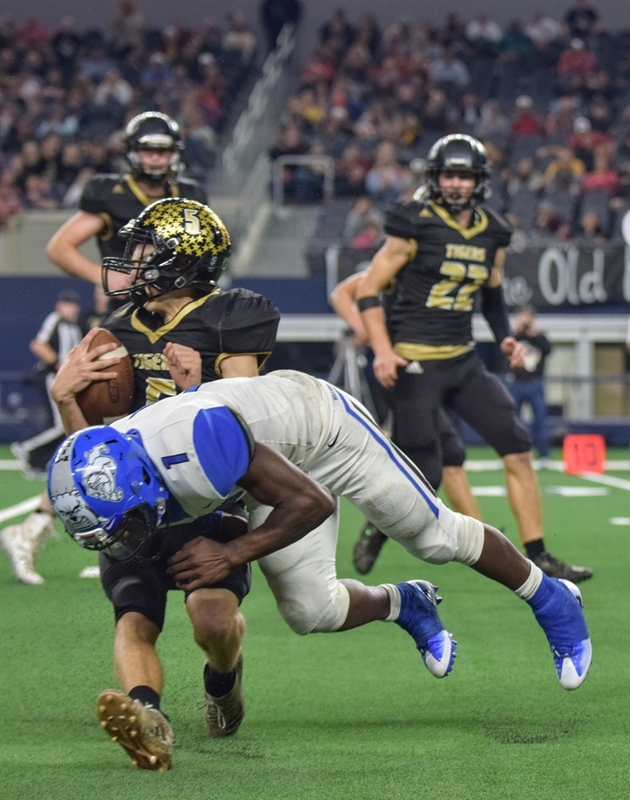 Crockett finished the game with a game-high 377 yards rushing and nine touchdowns – a new UIL state championship game record – while adding 81 yards and three scores through the air to outduel Milford’s TaRon Smith, who accounted for 294 total yards and seven touchdowns. Crockett and Smith accounted for all nine first half touchdowns, and Smith’s 28-yard TD pass to Damyan Woodward tied the game at 40-40 barely a minute into the third quarter. The Tigers went on to outscore the Bulldogs 60-38 in the second half as Crockett put the game out of reach, but Milford’s offensive effort reinforced just how good the Bulldogs’ have been on that side of the ball this season. McLean entered the game with the top statistical defense in all of Class 1A allowing an average of just 10 points per game, and only Garden City (34) and Aspermont (38) had scored more than 18 points against the Tigers’ his season. Milford scored on five of its six offensive possessions in the first half, but the McLean defense got a stop on two of the Bulldogs’ first five drives of the second half. Bradley Hannon hauled in an important interception that led to the wild touchdown pass from Crockett to Mann, and the Tigers later forced a turnover on downs with 9:22 remaining in the fourth to set up a 39-yard TD run from Crockett. Those stops proved to be the difference in the game as McLean scored on 13 of its 14 possessions and wore the Bulldogs down in the second half. The only drive that didn’t result in a Tigers’ touchdown was cut short by the completion of the second quarter. “Those were the key to the game right there,” McLean senior Chism Henderson said. “If we wouldn’t have gotten those stops, we would have gone back and forth. We came out and got a couple stops early and then it was back and forth so those were very key. While watching McLean’s Ben Crockett run wild to the tune of 458 total yards and 12 touchdowns in Wednesday’s Class 1A Division I state championship game, Milford coach Ronny Crumpton had his own star trying his best to keep the Bulldogs in a game which they entered as decided underdogs. While Milford and star senior TaRon Smith came up on the losing end of a three-and-a-half hour shootout at AT&T Stadium, it wasn’t without some highlight-reel, video game-like plays from the Milford quarterback. Milford's Taron Smith. Photo by Zac Byrd. When the game was over, Smith had completed 60 percent of his pass attempts for 178 yards and five touchdowns and rushed for 116 yards and two more touchdowns, and in the process given a dominant McLean squad all it wanted and then some. Crumpton said he knew what his team was facing in unbeaten McLean, which entered the game with seven shutouts to its credit and allowing an average of just 9.6 points per game – an out-of-this-world number in the 1A realm. But he also felt good about what his offense could do, and Smith was a big part of that confidence. On the other side, Crockett rushed for a UIL state championship record nine touchdowns with 377 yards on the ground. He also threw three touchdown passes on three completions. And the McLean junior knew he had to do everything in his power to combat the star on the other sideline. Rushing – Ben Crockett 35-377, Cayden Mann 2-23. Passing – Cayden Mann 10-13-0-181, Ben Crockett 3-4-0-81. Receiving – Kater Tate 5-63, Chishm Henderson 3-59, Cayden Mann 1-46, Jacob Watson 1-37, Dalton Abshire 1-30, Bradley Hannon 1-25, Ben Crockett 1-2. Rushing –TaRon Smith 19-116, Ricky Pendleton 4-71, Corbin Schrotke 1-5. Passing – TaRon Smith 15-25-1-178, Corbin Schrotke 4-7-0-61, Damyan Woodward 1-1-0-31, Ricky Pendleton 0-1-0-0. Receiving – Damyan Woodward 6-131, Ricky Pendleton 5-102, Corbin Schrotke 5-(-4), Tyvon Gates 2-29, JaSean Brooks 2-12.